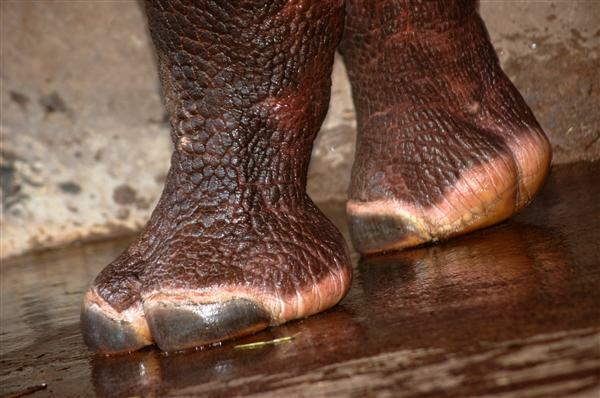 The Wonders of Rhino Feet | evolveit! BBC News Science and Environment recently published a very interesting story about how researchers at the Royal Veterinary College in London are working to uncover how rhino feet support the massive weight of their full-grown rhino counterparts. To accomplish this, the researchers are working with rhinos at the Colchester Zoo that are trained to walk across pressure pads. These pads allow the researchers to record exactly how the force is spread out across the bottom of the rhino’s feet. They hope that the data they collect will help zoos to better care for their rhinos and also potentially help to inform engineers developing devices that must carry heavy loads while moving. Here is a link to the article, which includes an excellent video of the researchers demonstrating the actual process of data collection in the zoo. Research projects such as this remind me of how many awesome mysteries of the natural world remain for scientists to uncover.